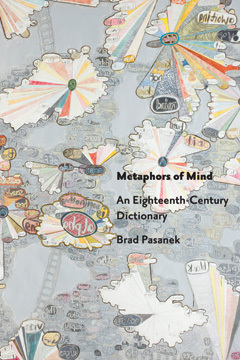 In my book, Metaphors of Mind: An Eighteenth-Century Dictionary, I analyze a set of over 10,000 metaphors that I've assembled from various electronic and traditional sources. These metaphors, drawn from the collection indexed by this site are available for download. (A SQL query from May, 2015 is archived here, as a zipped csv file.) Readers are encouraged to check my claims against my evidence or put my metaphors to new uses. My subject is "figurative empiricism" or "the general analogy of language." I consider the tacit assumption, shared by a variety of scholars, that changing metaphors are indicative—if not productive or constitutive—of broader cultural change. In contrast, my research makes clear that, with few important exceptions, metaphors of mind in the eighteenth century display astonishing persistence in the face of Enlightenment ferment and revolutionary change. I am keenly interested in digital innovations in humanities research. But I am also a student of the history of the book. While technology enables my approach to discourse, I remain situated in the longer tradition of philology and intellectual history. To best accommodate the materials, I've structured my investigations alphabetically, giving the whole the form of an encyclopedic dictionary (think Voltaire, not Johnson). That is, I've written essays under eleven headwords so as to shift my reader's attention from authors and texts to tropes and usages. The abecedarian order is intended to defamiliarize received ideas about mirrors and lamps and scramble the narrative of Enlightenment. In each entry I make local arguments about fancy's coinage, reason's empire, the court of conscience, strangers within, the mind's eye, a soldier's "mettle" or "metal," and so forth. Even the most unlikely metaphors have careers: the mind and its motions are once likened to meat rotating on a smoke-jack in the Memoirs of Martinus Scriblerus and then again in Tristram Shandy. "Metaphors of Mind is a genuinely significant book. An exciting and stimulating read, it promises to precipitate and augment important conversations both in eighteenth-century literary studies and in the field of digital humanities more broadly." "Pasanek has produced a kind of distant-reading-by-hand, combining scale and literary sensitivity by dint of hard, thoughtful work. Many scholars use search technology, but few have done it as self-consciously as Pasanek. Metaphors of Mind will be important both because of its concrete historical contributions, and because it theorizes a hermeneutic process that humanists already use unreflectively." "Metaphors of Mind is one of the truly major works of literary historical scholarship of the early 21st century. Not only is the book brilliantly conceived, groundbreaking, and significant, but it is also on the cutting edge of the digital technologies that scholars are so rapidly embracing. Pasanek's book is a work of profoundly engaging erudition, performing all the functions of investigation and criticism apparently effortlessly. The manuscript is beautifully written, extremely lucid and free of jargon, and downright funny." — Blakey Vermeule, Stanford University, author of Why Do We Care about Literary Characters? "Metaphors of Mind is one of the most compelling blends of traditional literary critical methods and the new digital humanities/data mining projects that literary studies has seen to date. With welcome clarity and disarming humor, Pasanek provides an eye-opening survey, peppered with vivid examples, of the countless ways in which eighteenth-century Anglo-American culture imagined perception and personal identity. I feel confident predicting that in the years to come Metaphors of Mind will be frequently cited, quarried, and emulated by historians, psychologists, philosophers, as well as literary critics." "Self-avowedly experimental, this book both transforms the form of the scholarly monograph and provides its best defense, all in the most understated—almost surreptitious—way. Pasanek's Metaphors of Mind constitutes a major intervention in eighteenth-century studies, but it is crucial reading in the field of media studies as well."